Summary: While the Yanukovych government has managed to initiate a number of economic reforms, they were implemented only partially and their success has been limited. Two years ago, the newly elected president of Ukraine, Viktor Yanukovych, announced an ambitious and comprehensive economic reform program. While some key measures, such as a new anticorruption campaign and judiciary reform, were not included in the initial agenda, many were still hopeful that, with the reforms, the new administration would be able to overcome the devastating blow that the global economic crisis delivered in 2008–2009, when Ukraine’s GDP fell by 15 percent. Thus far the Yanukovych government has managed to initiate tax and pension reform, made significant efforts to reduce administrative barriers for businesses, and completed negotiations with the European Union (EU) on an Association Agreement. These reforms, however, were implemented only partially and their success was limited. In fact, in some cases government actions led to serious social unrest. The main obstacles to reform have been a lack of policy consistency, the resistance of a corrupt bureaucracy, and more importantly, high-level officials’ disinterest in changing their ways. And most of the reforms were never begun and remain to be implemented in the future. In order to succeed in reform implementation, President Yanukovych must obtain support from a broader swath of Ukrainian society and use external anchors to stay on the reform track. Transparency and accountability should become the cornerstones of every government decision, and the administration needs to fully restore cooperation with international organizations. Although economic reforms have had limited success so far, the president still has time to implement changes that will lead to a more prosperous future for Ukraine. Ukraine has been moving toward a market economy since it declared independence in 1991. The way has been extremely difficult and bumpy. Twenty years after the beginning of market reforms, Ukraine is still struggling to build a strong, transparent, and sustainable economic system that can provide the Ukrainian people with economic prosperity and social security. A rapid expansion of the Ukrainian economy between 2000 and 2008 reduced the necessity for further economic reforms, but there was much that still needed to be done. In the second half of 2008 Ukraine began to feel the influence of the world economic crisis, but the Ukrainian government was not ready to react to the challenge and the country was hit very hard. Since the Ukrainian economy was highly integrated into the world economy, it was impossible to avoid negative consequences of the crisis. 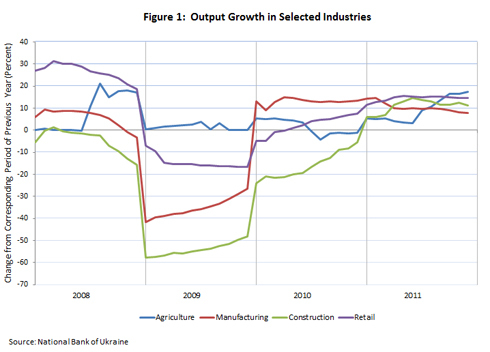 Figure 1 depicts the sharp decline in some of Ukraine’s industries. For instance, in January of 2009, as compared to January 2008, manufacturing decreased by 42 percent while construction collapsed by 58 percent. Economic growth in Ukraine was somewhat restored in the first quarter of 2010 with GDP growing by 4.8 percent. The index of basis industries had started to grow in November 2009, demonstrating the beginning of the economic recovery. But this recovery was caused by external factors, not domestic economic policy. The recovery of the world economy, growing demand for Ukraine’s primary exports, and increasing prices for metals were the main factors that started the Ukrainian economy on the road to recovery. (Though Ukrainian policymakers tend to praise themselves for good economic performance even when positive trends are exogenously caused.) 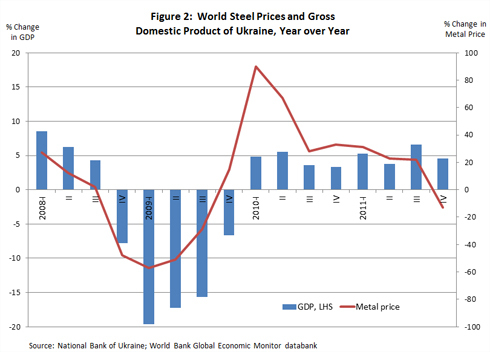 The strong correlation between world commodity prices and Ukraine’s economic growth can be seen in Figure 2. The crisis showed how fragile and unsustainable the Ukrainian economy is. A lack of systemic reforms, the archaic structure of the Ukrainian economy, and ineffective institutions were the main obstacles to building a truly free-market economy and a modern state. Providing some hope, the presidential elections of 2010 presented a unique opportunity for Ukraine to implement long-awaited reforms. Viktor Yanukovych won the Ukrainian presidential election in February 2010 and became the fourth president of Ukraine. During the election campaign Yanukovych stressed the necessity to reform the country, but his economic program—“Ukraine is for the people”—was more populist than substantive. He promised that Ukraine would become one of the most advanced countries, that it would secure a place among the top-ten states on the World Bank’s Ease of Doing Business Index, and that its population would increase to 50 million people. Yanukovych also promised tax holidays for small businesses, a rural recovery program, an increase in social benefits, and more. Despite his famous campaign promise of “improvement of life starting today,” from day one, the new president applied his efforts to concentrating his power. On March 11, 2010, 235 members of parliament created a new coalition called “Reforms and Order.” On the same day, the coalition appointed a new government and Mykola Azarov, a longtime Yanukovych ally, became prime minister. On September 30, 2010, Ukraine’s Constitutional Court invalidated amendments that had been made to the constitution in 2004 and restored the constitution of 1996, a decision that significantly increased the role of the president. That meant that Yanukovych received more power than Kuchma ever had. Thus, in less than a year, Viktor Yanukovych became responsible for all of the country’s policies. Sustainable Economic Development included state budget stabilization, financial sector stabilization, and reform of intergovernmental fiscal relations. Improvement of Life Standards and Social Services included reforms of the medical care and pension systems, education reform, and reform of the social support system. Improvement of Business Climate and Increasing Investment included deregulation and development of entrepreneurship, privatization, and state management; progress in the research and development and innovation sectors; and international integration and cooperation. Modernization of Infrastructure and Basic Sectors included reforms of the electrical energy sector, coal sector, gas and oil industry, transportation infrastructure development, agricultural sector development, and land reform. In total, the program included 21 different reforms that would be enacted between 2010 and 2014. As President Yanukovych said, “the Program is a document which provides clear guidance on how to reform Ukraine’s economy and achieve our main goal—the improvement of people's lives. I would like to repeat again: all further steps of the government . . . must be made in strict accordance with the provisions of the Program.” It was very detailed and included a meticulous analysis of challenges, aims and objectives, necessary steps, stages of reforms, and success indicators. The program was positively assessed by both experts and international organizations, including the IMF, which in the summer of 2010 opened a new program for the Yanukovych government. “The authorities are committed to addressing existing imbalances and putting the economy on a path of durable growth through important fiscal, energy, and financial sector reforms,” said IMF First Deputy Managing Director John Lipsky. “Sustained implementation of these reforms will help Ukraine entrench macroeconomic stability, boost confidence, facilitate access to capital markets, and emerge with more balanced and robust growth.”5 The IMF cancelled the 2008 Stand-By Arrangement made with the government of Yulia Tymoshenko and drew up a new twenty-nine-month arrangement in the amount of approximately $15 billion. After two years in office, Yanukovych has implemented several reforms from his program. Among his main achievements are the adoption of a tax code, pension reform, and the completion of negotiations with the European Union on an Association Agreement. Yet, other reforms, such as administrative reform, have had only limited success, and the vast majority of reforms are still to come. Two weeks after the announcement of its economic reform program, the Ukrainian government submitted its draft of the tax code to the parliament. The initial draft was very low quality. Even the president was not satisfied with the draft, calling it “unbalanced,” and he demanded serious improvement. The parliament rejected the draft in September 2010. In October another draft of the tax code was submitted, and the parliament adopted it on November 18, 2010 without proper consultations with economic experts and businesses. The code imposed an additional tax burden on small entrepreneurs and limited the use of the simplified taxation system that had allowed some to evade taxes, which prompted tens of thousands of entrepreneurs to come out to protest, and political and social tension dangerously increased in the country. On November 30 the president vetoed the code. The parliament finally made changes to the document on December 2 and adopted the code without reforming the simplified taxation system. The president signed the tax code into law the next day and it became effective on January 1, 2011. Such swift adoption of the tax code serves as evidence that no substantial analysis or revision was carried out either by the government or the parliament. The overall quality of the new code remained low and none of the opposition’s recommendations were considered in the final version of the law. The fact that the new tax code came into force just one month after it was adopted came as a shock to small businesses and their accountants, who had practically no time to get acquainted with the new regulations. The adoption of the tax code was one of the biggest achievements of the government in 2010. It made several changes to taxation system. First, the number of state taxes was reduced from 29 to 19 and local taxes from 14 to 4. According to a separate law, contributions to four different social insurance funds—the Pension Fund, Social Security Fund, Unemployment Insurance Fund and Fund for Social Security against Industrial Accidents —were replaced by one unified social payment. Second, tax rates were lowered. According to the new tax code, corporate income tax will decrease from 25 percent in 2010 to 16 percent in 2014, and the value-added tax (VAT) will be reduced from 20 percent to 17 percent. The government also exempted certain businesses and business activities from the VAT for three years. Taking into account that public debt grew to almost 40 percent in 2010 from just 12 percent in 2008, this tax reduction looked premature. Pressed by the IMF, which was concerned about Ukraine’s fiscal deficit, the government agreed to slow down tax rate cuts for corporate profits to two percentage points per year through 2013. Finally, under the new tax code fewer small entrepreneurs and types of business activities will be eligible to use the simplified taxation scheme, the use of which was widespread among small businesses. Many of those businesses used it for tax evasion in the past, so the curtailing of its use improved fiscal discipline to some extent. In addition, in July 2010 the government sent a Letter of Intent and Memorandum of Economic and Financial Policies to the IMF that stated it was going to introduce a property tax on large real estate. This tax, however, only has a minor effect because the tax base is very narrow—only residential real estate is taxed while commercial real estate is not. In addition, the tax is based on the area of a house or apartment, not its value. Thus the owner of an apartment in the center of a city will pay the same amount of tax as the owner of a similar apartment somewhere in the slums. At the same time, the taxation of luxury items was blocked; although a draft on luxury tax was developed by the government in April 2010, it didn’t appear in the final draft of the tax code. Despite the IMF’s overall positive assessment of the new tax code, the fund raised concerns that “while the code introduces some welcomed changes in tax policy, it is also a missed opportunity to improve further the quality of tax legislation and administration.”8 What’s more, the process of developing the code, the discussion in the parliament, and the code’s implementation showed considerable lack of cooperation with the opposition, businesses, and entrepreneurs. Many entrepreneurs treated this code as a betrayal, since during his presidential campaign Yanukovych had promised five-year tax holidays. In reality, the tax burden for small businesses increased. Many analysts concluded that the tax code was adopted in favor of the wealthy and big businesses while ordinary people and small entrepreneurs suffered from it. The biggest hole in the Ukrainian tax system is tax avoidance through offshore havens. A draft law that criticizes a Soviet-era treaty with Cyprus that allows entities to avoid double taxation was submitted by the government to the parliament in June 2011, but the draft was never considered. If the government is truly committed to building a fair tax system, it should adopt measures to fight tax avoidance. The people must see that the tax system is fair and transparent. Ukraine inherited the Soviet pay-as-you-go pension system, and ever since Ukraine declared independence, there has been no attempt to rebuild it. Now, the Ukrainian pension system is facing acute financial difficulties and requires large transfers from the state budget just to stay afloat. Ukraine spends an increasingly high share of its GDP on pensions. Between 2003 and 2005, pension expenditures increased from 9.2 percent of GDP to 15.3 percent. This dramatic growth was largely a product of the 2004 presidential elections. According to a decision made by then prime minister Yanukovych’s government, all pensions less than the subsistence minimum were increased to that level. Almost 12 million pensioners benefited from the increase, but the decision also created a paradox—the minimum pension became higher than the minimum wage. The situation continues to be aggravated by pension increases that take place before each election, as such increases are chaotic and politically, not economically, motivated. In 2007 pension expenditures accounted for 13.9 percent of GDP, in 2008 15.8 percent, and in 2009 over 18 percent. The level of pension expenditure in Ukraine has become one of the highest in the world. Pension reform was initially included in President Yanukovych’s reform agenda. It provided for several changes to the pension system, including an increase of the minimum required insurance period from five to fifteen years, the gradual increase of the pension age for women from fifty-five to sixty years old, and the increase of the qualification period for receiving full pension benefits by ten years. The same provisions were included in the Letter of Intent and Memorandum of Economic and Financial Policies that was signed by Prime Minister Azarov and sent into the IMF on July 16, 2010.9 The government promised to enforce these changes by the end of December 2010. An IMF mission visited Kyiv on November 3–15, 2010 to conduct discussions on the first review under its Stand-by Arrangement with Ukraine. It became clear during the review that without pension reform, the government would not receive the next disbursement. The draft of the pension reform law was then submitted to the parliament on December 13, 2010 (as stipulated in a second Letter of Intent dated December 10, 2010), but in the best Ukrainian political tradition, the text was not made available to the general public. Sergey Tigipko, vice prime minister responsible for social reforms, refused to explain the main provisions of the document and stressed that the public discussion of the pension reforms would be conducted when they were considered in the parliament. Some politicians and experts had concerns that the government would not fulfill its obligations to the IMF and would not increase the retirement age because it was such a sensitive issue. Eventually, the Ukrainian government put pension reform on hold, and as a result the IMF suspended its program in the spring of 2011. The draft of the pension reform law was resubmitted to the parliament in June 2011. On July 8, the parliament voted for the reform bill and President Yanukovych signed it into law on September 9. The adoption of the reforms was important for the improvement of Ukraine’s pay-as-you-go pension system and the achievement of its future financial sustainability. The process of pension law adoption, however, showed two key weaknesses of the government: First, it demonstrated the government’s lack of transparency and lack of interest in—or even ability to—explain its policies to and conduct dialogue with the Ukrainian people. Second, pension reform was painful for ordinary people but the wealthy kept their privileges. While the majority of people receive pensions that equal 45 percent of average wage, some groups get to keep 80–90 percent of their previous wage even though all pensions are being paid from the same solidarity fund. There are other flaws in the system as well. The increase in the retirement age for women does not provide immediate relief to the Pension Fund, as it only affects those women who are currently thirty-five and younger. Special pensions were not cancelled and the pension system remains unjust. Moreover, a second pillar of the reforms—the compulsory and personalized accumulative system—has not been introduced, and the current pension system remains fiscally unsustainable. One of the most controversial of the government’s steps was an attempt to reform the system of social programs and privileges. Desperate for austere measures that would reduce the budget deficit, on June 14, 2011 the parliament amended a law on the state budget for 2011. With the new law, the government was granted the right to determine the order and the size of benefits being paid out to persons affected by the Chornobyl disaster, children of war, and military veterans. Thus, any future government decision on this matter would overrule the law. The law also stated that the size of the benefits would be calculated based on the Pension Fund’s available financial resources. Opposition members of the parliament appealed to the Constitutional Court demanding that the law be banned. Yet the court ruled the changes constitutional. This contradicted the decisions the Constitutional Court made in 2007 and 2008 when it deemed any limitation on rights to social benefits unconstitutional. Many opposition leaders, experts, and journalists claimed that such inconsistency in interpretation of the constitution is clear evidence that the Constitutional Court is no longer an independent branch of power. Since the government did not pay out several types of social benefits that were stipulated in the legislation, over a million people submitted claims. As of November 1, 2011 local courts had considered 1.2 million claims related to the pension provision in the amount of $800 million (UAH 6.4 billion), including 115,600 Chornobyl-worker claims that totaled $ 225 million (UAH 1.8 billion). In return, the government developed a draft law on state guarantees of the enforcement of court decisions. On September 9, 2011 the Ukrainian parliament adopted the law in the first reading. According to the law, sixteen different categories of citizens would lose some of their privileges. Hundreds of Chornobyl rescue workers and Afghan war veterans took to the streets in protest. On September 20 at least 3,000 people protested near the parliament in Kyiv alone, almost breaking into the building. A two-meter-high iron fence was built around the parliament building the following night in order to prevent similar outbreaks. Despite this government response, in March 2012, five months after the protests, President Yanukovych unexpectedly announced new social initiatives. “We must restore public confidence in state policies aimed at improving the lives of citizens. We need to restore the fundamental principle of social justice,” Yanukovych stressed at a meeting of the Cabinet of Ministers. The president promised to increase 9 million pensioners’ monthly pensions by at least $13 (UAH 100), increase benefits to low-income families, pay out $125 (UAH 1,000) reimbursements to 6 million depositors from the Soviet era, and guarantee affordable state-subsidized mortgage loans at 2–3 percent per year. Prime Minister Azarov calls these initiatives “historic” and stresses that “our main goal now is to fulfill these tasks which President put forward and we are going to do it via economic growth, improvement of tax administration, that is, the reduction of the shadow economy and productivity growth at domestic enterprises.” Tigipko said that funding for these initiatives would come from increased customs revenues and the introduction of a luxury tax. According to Iryna Akimova, the head of Committee on Economic Reforms, the money could be obtained from economic growth and the reduction of the shadow economy. According to the Ministry of Finance, the government needs an additional $1 billion (UAH 8 billion) to fund these initiatives, while Vice Prime Minister Tigipko maintains that most of the initiatives will require at least $2 billion (UAH 16 billion) this year and Prime Minister Azarov claims that all social initiatives will cost $3.1 billion (UAH 25 billion). The announcement of ambitious and extensive new social programs that would cost 1.5 percent of GDP just five months after a refusal to pay existing benefits and the lack of a clear financing strategy demonstrate that Yanukovych has started to think about upcoming parliamentary elections scheduled for October 28, 2012. This social spending hike is similar to those of 2004, just prior the presidential election, when then prime minister Yanukovych increased pensions. President Yanukovych also mentioned that the state will fix income redistribution mechanisms and radically reduce privileges for those who do not need state financial support. The president, however, did not provide any further details. Meanwhile, according to Prime Minister Tigipko, only 23 percent of all social benefits go to poor. But with the parliamentary elections approaching, there is little hope that the government will do what is needed: limit social benefits for privileged groups and monetize privileges for other members of society. Meanwhile, with over 320 different kinds of benefits, privileges, and compensation, the social benefit system remains extremely costly and inefficient.11 Nothing was done to change the system. In January 2009 then prime minister Yulia Tymoshenko signed a ten-year natural gas contract with the Russian prime minister, Vladimir Putin. For the first time in the history of Russian-Ukrainian energy negotiations, a clear formula for gas price calculation was introduced, which linked the gas price with the prices of gasoil and black oil. Tymoshenko claimed that this contract was a victory for Ukraine because it allowed a price to be fixed without any political interference. More importantly for Tymoshenko, the intermediary company RusUkrEnergo was eliminated from future gas trading and Ukraine received a 20 percent discount for the year 2009. As a result of this contract, the 2009 gas price for Ukraine was set at the level of $228.80 per 1,000 cubic meters. By contrast, in 2008 Ukraine paid $179.50 per 1,000 cubic meters, while the average European price was more than $400. The gas deal has had disastrous consequences for Ukraine. The basis price in the formula was set at a very high level—$450 per 1,000 cubic meters. The annual amount of gas that Ukraine had to consume was defined at yet another high level—52 billion cubic meters per year—and Ukraine was not granted the right to reexport the gas. Thanks to the new formula, at the beginning of 2010 the price of gas jumped to $304. The gas price discount, however, was largely virtual. Since the gas price is linked to the price of oil products, as the oil price went up, Ukraine started to pay a much higher price for Russian natural gas. The price was $232 per 1,000 cubic meters in 2010 and $264 in the first quarter of 2011. It then jumped to $416 at the beginning of 2012 (which includes the discount; the price without the discount was $516). The Yanukovych administration also made a serious effort to change the gas price formula introduced by the Tymoshenko-Putin deal in 2009. Ukraine’s main argument was that it pays a much higher price for Russian gas than Germany does. As Prime Minister Azarov explained it, Ukraine’s demand is very simple: it does not want any discounts or privileges, and for Ukraine, a fair price for natural gas would be calculated as the gas price for Germany minus the payment for gas transit. That means a fair price for Ukraine should not exceed $220–250 per 1,000 cubic meters. Azarov even stated that it is much cheaper to buy natural gas from Germany and bypass Russia altogether. Gas negotiations between Ukraine and Russia are currently stalled. The CEO of Naftogaz, the Ukrainian state oil and gas company, stated that all possible chances of resolving the gas price puzzle have been exhausted at the company level. Negotiations will continue at the presidential level, and since Putin will not take office until May, a positive outcome will have to wait at least until the fall of 2012. The need for reform is not just apparent between states. Ukraine’s domestic policies are also flawed. Though the extremely high price for Russian natural gas creates a very strong incentive for energy sector reform and Ukraine is one of the least energy efficient countries in the world, no serious changes in this area have been implemented. Still, energy issues remain the most important for the country’s future. Naftogaz runs a substantial deficit, which the government uses the state budget to cover. In order to eliminate Naftogaz’s deficit, the government stated in its first Letter of Intent to the IMF that it would increase gas prices by 50 percent in April 2011 and semiannual increases of gas prices paid by households and utility companies would continue until domestic price levels reached import parity. Since the population pays only one-fifth of the price of gas, the IMF requested that the price be increased so that the cost would at least be covered. The government received two tranches from the IMF, but this measure, however, was never implemented. The Ukrainian government tried to persuade the IMF that the price hike was not necessary because Ukraine would negotiate with Russia to secure cheaper gas. The IMF did not conclude its second review of the Stand-by Arrangement with Ukraine in the spring of 2011, and the fund decided to suspend the program in order to “enable some additional technical work to be carried out” by Ukraine. Even when the hope of getting cheaper gas from Russia vanished, the Ukrainian government remained reluctant to increase the price paid by the population. In January 2012, after negotiations with the IMF in Washington D.C., Vice Prime Minister Tigipko said at a press conference in Kyiv, “It is our clear-cut position—there will be no tariff increase, no increase in payments for utilities until the elections. We are not going to do it this year.” Negotiations with the IMF, he said, are at a very deep impasse. Yanukovych rejected the possibility of increasing the natural gas price. “The demand of the International Monetary Fund to raise by 50 percent the price of gas for the population is unacceptable, and we have not agreed and will never agree with that,” the president said on March 6, 2012. It seems that the current government is allowing political dividends to drive policymaking. Instead, it should increase the gas price and provide direct subsidies to the population. The current system of subsidies to utility providers is inefficient, costly, and corrupt, and Ukraine has not undertaken any attempt to monetize utility privileges. The government-regulated prices for domestically produced natural gas remain artificially low, and there are no incentives to increase domestic natural gas production. The Ukrainian energy sector is also notoriously nontransparent. Edward Chow, an energy expert, observed during the U.S. Senate Committee on Foreign Relations hearing on Ukraine that “if you were to design an energy system that is optimized for corruption, it might look very much like Ukraine’s.”12 The vested interests in the energy sector are so powerful that almost all attempts to reform it have been blocked by the rent seekers. The problems of the Ukrainian energy sector are well-known and documented by the International Energy Agency.13 Reform programs have already been developed by different international organizations and are waiting to be implemented. If Yanukovych has the political will to reform the energy sector then the government should use external anchors, such as the IMF, the World Bank, and the European Union, in order to implement comprehensive energy sector reform. The creation of favorable business environment in Ukraine and the development of entrepreneurship were among the priorities of the economic reform agenda. Among the biggest achievements of the government are the reduction and simplification of permit requirements for businesses, the reduction of the number of licenses for various business activities, the adoption of automatic VAT refunds for large enterprises, the introduction of a unified social payment, and the adoption of a customs code. Two years of reforms, however, have not resulted in an improvement of the business climate (see Table 1 for relevant indicators). Ukraine’s position on the economic freedom index has not improved much at all, while the ease of doing business is worsening. Corruption is undoubtedly the biggest obstacle to Ukraine’s economic development and the situation has become much worse under the current administration. * - maximum score is 5. Result for 2012 is end of 2011. In 2012 Ukraine’s ranking on the Ease of Doing Business Index was 152nd out of 183 countries; the country is in the bottom 20 percent, among worst-performing countries in the world. The recent policy reforms, such as the reduction of tax rates and number of taxes and the simplification of the permit system, however, were not reflected in the 2012 ranking, so a significant improvement in Ukraine’s position over the next year is to be expected. The prevalence of informal business practices was revealed in the “Investment Climate in Ukraine as Seen by Private Businesses” survey conducted by the International Finance Corporation for Ukraine in March and April 2011.15 The survey showed some positive developments—businesses need to obtain fewer permits, it takes less time to obtain them, and the technical regulations system is improving. Yet, the share of companies that confirmed that they had resorted to unofficial means to solve problems with state officials grew from 35 percent to 46 percent within the last two years. The average company spent 10 percent of company turnover in 2010 on those unofficial avenues, while two years ago it was 6 percent. The most important element in the development of a favorable investment climate is the creation of a level playing field for domestic and foreign investors. Currently, it is difficult for foreign investors to protect their investments in Ukraine. And since foreign investors are not as well-connected politically as domestic investors, they are very reluctant to start new businesses in Ukraine. 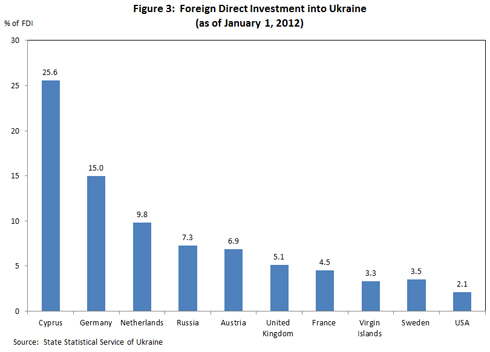 As of January 2012 Ukraine attracted $49.4 billion in foreign direct investment (FDI). The shares of the main investing countries are shown in Figure 3. In the last two years, under Yanukovych, 43 percent of all FDI came from Cyprus, 9.9 percent from Russia, and 8.8 percent from the Netherlands and Austria. At the same time American investors withdrew $344 million. Without improvement of business climate, the country will not be able to attract foreign investment at a time when Ukraine badly needs additional financing and there is substantial potential for attracting foreign investors. The fundamental flaws of the Yanukovych administration stem from its lack of transparency and accountability. The initial reserved optimism about economic reforms was replaced with frustration and even anger. This disappointment with government policy was caused by a sharp contrast between words and actions. Power was concentrated in the hands of one political force, which has created an environment of contempt for political opponents and civil society. The signing of the controversial Kharkiv Accords is a vivid example of this. The deal was ratified in the parliament without any discussion just one week after it had been signed by the president. The opposition’s attempts to block ratification led to physical fights, and many members of parliament received serious injuries. More importantly, not only was the dialogue with opposition in parliament limited, the ruling administration also failed to conduct a dialogue with society more broadly and explain the reforms and concrete measures the government was implementing. Even the positive steps toward a more effective and transparent economy have had limited success, with many either watered down or ignored. The law on public procurement, which regulates the government’s procurement of goods and services, was amended in such a way that a significant amount of money is spent without tenders. Thus, since June 2010 all procurements for the Euro2012 soccer championship have been carried out noncompetitively, with the government claiming that it needed to expedite matters because it was running behind on its deadlines. After the amendments in July 2011, all procurements for the Agrarian Fund, which amasses products that come from farms, are conducted without tenders. And the share of public procurement without tenders is growing; new amendments to the procurement law are expected to be considered in the parliament soon. As a result, corruption and sizeable kickbacks have increased significantly. Privatization has also been carried out nontransparently and uncompetitively in favor of chosen buyers. For instance, on March 11, 2011 the State Property Fund sold 93 percent of Ukrtelecom, Ukraine’s monopolistic telecommunications company, to the private Austrian investment company EPIC for $1.3 billion. EPIC was the only bidder and paid a nominal price. Ten other companies, including Germany’s Deutsche Telekom, the Norwegian Telenor, and the Russian Alfa-Group, were not allowed to participate. The government did not want foreign governments to gain control over the country’s main telecommunications company. After signing the privatization agreement, the head of the State Property Fund, however, could not provide any information about the new owner of the company. Similar nontransparent privatizations took place in the energy sector. So far, Yanukovych’s anticorruption campaign has had limited results and corruption remains a systemic, large-scale problem. In May 2011 the Group of States against Corruption (GRECO), a body of the Council of Europe, released an addendum to its Compliance Report on Ukraine, warning that the National Anticorruption Committee had been established directly under the authority of the president of Ukraine, who appoints its members. GRECO noted that “this body does not appear to be in a position to perform an effective, independent monitoring of anti-corruption strategies and policies.”18 Ukraine did not manage to develop a detailed plan of action for the implementation of its National Anticorruption Strategy in accordance with GRECO's recommendations. Moreover, out of those 25 recommendations, only twelve are reported as having been implemented satisfactorily or having been dealt with in a satisfactory manner. On April 7, 2011 the parliament adopted two new anticorruption laws—“On the Principles of Preventing and Combating Corruption” and “On Amendments to Several Legislative Acts Concerning Liability for Corruption Offenses.” Among other things, under a provision that became effective in January 2012, all government officials were obligated to disclose their income and expenditure statements starting in July 2011. At the end of February 2012, however, members of parliament from Yanukovych’s Party of Regions appealed to the Constitutional Court requesting that this provision be banned for the year 2011. The court satisfied their request, ruling the provision unconstitutional. To many in Ukraine this serves as a clear sign that the ruling party is not interested in fighting corruption and is trying to avoid transparency and accountability on the eve of the parliamentary elections. In addition, although some of Yanukovych’s supporters were arrested on corruption charges, none of his close allies was approached by law enforcement. The anticorruption campaign did, however, become a very useful tool for persecution of the opposition. For example, the criminal case against Mykola Rudkovskyi, a former transport and communications minister in Yanukovych’s government, was closed in June 2010. Rudkovskyi used public funds to charter a flight to Paris for his personal entertainment. Meanwhile, Yuriy Lutsenko, a former interior minister under Tymoshenko and outspoken opponent of Yanukovych, was charged with embezzlement and abuse of office for hiring a driver and spending money on a police day celebration. He was sentenced to four years in prison and his property was confiscated. Yet, with corrupt bureaucracy’s fierce resistance to reforms, the president cannot simply count on a small team of dedicated reformers. If the president wants to fully implement his reforms, it is vitally important to bring the broader society as well as international organizations into the dialogue and policymaking process. In order to be prepared for future challenges, Ukraine has to focus on strengthening its economy, implementing austerity measures, and working hard to reach its strategic goals. After two years in office, Yanukovych has consolidated his power but has made only limited efforts to reform the economy. The announced reforms were implemented only partially, and the bulk of the reforms are yet to come. In his first two years of reforms, Yanukovych has not created a wide group of winners. Ordinary people do not understand the reform agenda and do not support the government’s attempted changes because communication between the authorities and the society is flawed, if not nonexistent. And with the exception of extreme cases, Ukraine’s civil society is not strong enough to influence the authorities’ decisions. Without open lines of communication with the people, the government is likely to make political, economic, and social mistakes and vested interests will prevail. Even if the president continues to pursue his reform agenda, without public support and control, the reforms could be sabotaged by those who are not interested in changing the status quo. These two years of reform clearly show that Ukraine needs external anchors in order to stay on the path to reform. Relations both with the West and Russia, however, are dysfunctional, and Ukraine is now more isolated than ever. Ukraine’s relationship with Russia is now much worse than on the day Yanukovych was inaugurated. Two years of negotiations have demonstrated that Moscow is intent on pursuing its own economic interests and is not ready to reduce the natural gas price for Ukraine. It would be impossible for Ukraine to get any price discounts without substantial economic and/or political concessions. At the same time, Russia, unlike the West, cannot offer any substantial incentives for Ukraine to improve its governance, enhance transparency, fight corruption, reduce its shadow economy, or strengthen the rule of law. Clearly, Russia cannot serve as an anchor for reform. The three most important foreign partners for Ukraine are the International Monetary Fund, the World Bank, and the European Union. Yanukovych, however, faces substantial difficulties in cooperation with these Western institutions. The program of cooperation with the IMF has been postponed, and without that program, Ukraine will find it difficult to repay its external debts. The government currently borrows money at an interest rate of 13–15 percent in Ukrainian hryvnia or 9.3–9.6 percent in U.S. dollar terms, and in 2012, Ukraine must repay $8.2 billion of its domestic and external debt, amounting to 4.5 percent of its GDP. There is little hope that other financial institutions, countries, or investors will help Ukraine on this front. The restoration of cooperation with the IMF would send a strong positive signal to investors. The World Bank continues to work with Ukraine and provides valuable assistance on the road of reform. In February 2012 the World Bank announced a new Country Partnership Strategy for Ukraine which aims to help the country implement its reform program by strengthening institutions, providing public governance, and supporting a more participatory reform process. Taking into account the risks and lessons of previous programs, the bank, however, proposed a calibrated approach, which means that available financing would depend on the country’s reform commitment. The World Bank lending program would provide up to $500 million, and in addition, the International Financial Corporation would lend up to $400 million annually. It is up to Ukrainian authorities whether Ukraine is going to receive this much-needed assistance or not. Finally, relations with the European Union are very unstable. President Yanukovych declared that European integration is a priority for Ukraine, and his administration managed to conclude negotiations on an Association Agreement with the European Union. The four-year-long negotiation process was completed in the fall of 2011, and the agreement involves the establishment of a deep and comprehensive free trade zone and a visa-free regime. The EU, however, refused to accept a loosening of democratic principles in Ukraine and the persecution of the opposition there. A criminal case against former prime minister and opposition leader Yulia Tymoshenko, which the EU and United States considered politically motivated, became the main obstacle to signing the Association Agreement at the December 2011 Ukraine-EU Summit. Although the parties agreed to initial the agreement, the EU has made it clear that as long as Tymoshenko and other opposition leaders are persecuted, it will not finalize the agreement. In order to stay on the reform track, the government needs to fully restore cooperation with international organizations. The recent tensions in relations should be treated as a serious signal to the government that it has ventured off course. While Ukrainian and foreign experts do not question the content of the reform agenda, whether the government is truly dedicated to implementing the economic reforms that will lead to more prosperous and democratic future of Ukraine remains an open question. Nazar Kholod is a political economist whose work focuses on the economic and social policy and market transformation of the Central and Eastern European countries. He is especially interested in economic policy of contemporary Ukraine. Dr. Kholod previously served as an Associate Professor at the Department of Economics and International Economy at Ivan Franko National University of Lviv, Ukraine. Dr. Kholod is a recipient of two research fellowships sponsored by the U.S. Department of State. He was a visiting scholar at the Center for Russian, East European and Central Asia Studies of the University of Washington (Regional Scholar Exchange Program) in 2003 and Fulbright-Kennan scholar at the Woodrow Wilson International Center for Scholars (Fulbright Senior Scholar Program) in 2006. Kholod is the author of Rozpodil dokhodiv i bidnist u perekhidnykh ekonomikakh [Income Distribution and Poverty in Transitional Countries] (Lviv University Press, 2009) and a number of articles and book chapters on economic policy in transition countries of Eurasia. He earned his Candidate of Science and Doctor of Science degrees in economics from Lviv University, Ukraine. Kholod frequently provides comments on the economic development and policy at Voice of America Ukrainian Service and writes weekly economic blog for its website. 1 Anders Åslund, How Ukraine Became a Market Economy and Democracy, (Washington, D.C.: Peterson Institute for International Economics, 2008). 2 World Bank, Country Partnership Strategy 2012-2016 for Ukraine for the period FY12-FY16, January 20, 2012, http://siteresources.worldbank.org/UKRAINEEXTN/Resources/328532-1328450253285/full_report_ENG.pdf, (accessed on March 23, 2012). 3 International Monetary Fund, Ukraine: Ex Post Evaluation of Exceptional Access Under the 2008 Stand-By Arrangement, November 2011, (IMF Country Report No. 11/325), http://www.imf.org/external/pubs/ft/scr/2011/cr11325.pdf, (accessed on March 23, 2012). 4 Programa ekonomichnykh reform na 2010-2014 roky “Zamozhne suspilstvo, konkurentospromozhna ekonomika, efektyvna derzhava” [The Program of Economic Reforms for 2010-2014 “Prosperous Society, Competitive Economy, Effective Government”], http://www.president.gov.ua/docs/Programa_reform_FINAL_1.pdf, (accessed on March 11, 2012). 5 IMF Approves $15.1 Billion Loan for Ukraine, IMF Survey Magazine, August 11, 2010 http://www.imf.org/external/pubs/ft/survey/so/2010/car081110a.htm, (accessed on March 11, 2012). 6 Ukaz Prezydenta # 1001/2011 “Pro Natsionalnu antykoruptsijnu strategiju na 2011-2015 roky” [Decree of the President #1001/2011“On National Anticorruption Strategy for 2011-2015”], http://www.president.gov.ua/documents/14092.html, (accessed on March 11, 2012). 7 World Bank, Doing Business Index. Reforming through Difficult Times, http://www.doingbusiness.org/reports/global-reports/doing-business-2010, (accessed on March 23, 2012). 8 International Monetary Fund, Ukraine, First Review Under the Stand—By Arrangement—Staff Report; Staff Statement; Press Release on the Executive Board Discussion, February 2011 (IMF Country Report No. 11/52), http://www.imf.org/external/pubs/ft/scr/2011/cr1152.pdf,(accessed on March 23, 2012). 9 International Monetary Fund, Ukraine, Request for Stand-By Arrangement and Cancellation of Current Arrangement Staff Report; Staff Supplement; Press Release on the Executive Board Discussion, August 2010 (IMF Country Report No. 10/262), http://www.imf.org/external/pubs/ft/scr/2010/cr10262.pdf, (accessed on March 11, 2012). 10 Mykola Azarov: “Uryad ne pidvyshchuvatyme pensiynyj vik” [The government will not increase the pension age] http://www.kmu.gov.ua/control/uk/publish/article?art_id=243793798&cat_id=243311332, (accessed on March 23, 2012). 11 Nazar Kholod, Rospodil dokhodiv i bidnist u perekhidnykh ekonomikakh [Income Distribution and Poverty in Transitional Countries], (Lviv University Press, 2009). 12 Opening Statement by Edward C. Chow at the Senate Foreign Relations Committee “Ukraine at a Crossroads: What’s at Stake for the U.S. and Europe?,” February 1, 2012, http://www.foreign.senate.gov/imo/media/doc/Ed%20Chow%20-%20Testimony1.pdf, (accessed on March 24, 2012). 13 The International Energy Agency, Ukraine: Energy Policy Review 2006, (OECD/IEA, 2006), http://www.iea.org/textbase/nppdf/free/2006/ukraine2006.pdf (accessed on March 24, 2012). 14 The Heritage Foundation, Index of Economic Freedom, http://www.heritage.org/index/pdf/2012/countries/ukraine.pdf, (accessed on March 13, 2012). 15 International Financial Corporation, Investment Climate in Ukraine as Seen by Private Businesses, October 2011, http://www.ifc.org/ifcext/uspp.nsf/AttachmentsByTitle/ICreport_ENG/$FILE/IC_report_2011_eng.pdf, (accessed on March 23, 2012). 16 European Business Association, Investor Confidence in Ukrainian Market Sees Unprecedented Drop, http://www.eba.com.ua/sites/default/files/files/press-releases/PR_20_12_2011_ENG.doc, (accessed on March 12, 2012). 17 Kyiv International Institute of Sociology, Corruption in Ukraine, (KIIS, 2011), http://kiis.com.ua/img/pr_img/20110920_korup/Corruption%20in%20Ukraine_2007-2009_2011_Ukr.pdf, (accessed on March 13, 2012). 18 Group of States against Corruption. Joint First and Second Evaluation Round. Addendum to the Compliance Report on Ukraine, Strasbourg, May 2011, http://www.coe.int/t/dghl/monitoring/greco/evaluations/round2/GrecoRC1&2%282009%291_Add_Ukraine_EN.pdf(accessed on March 24, 2012). 19 Vystup Prezydenta UkrainyViktoraYanukovycha na XIII zjizdi Partii Regioniv [Statement by the President of Ukraine Viktor Yanukovych at the XIII Congress of the Party of Regions], March 17, 2012, http://www.president.gov.ua/news/23417.html, (accessed on March 24, 2012).